Agencies know proving value to their clients is important, and with 80% of companies outsourcing all or part of their social media marketing tactics, that’s a big job. At Sprout, we understand the needs and nuances of agencies and we’re here to provide a solution. We recently launched the Agency Partner Program, and now we’ve released a reporting feature agencies need: Report Builder. Report Builder, available to Agency Partner Program participants and included with Sprout’s Advanced plan, provides agencies and brands with tools to create customized reports tailored specifically to their needs and the needs of their clients. Tl;dr: Spend less time putting together client reports and more time taking advantage of the ping pong table in the break room. Report Builder enables you to quickly build reports using Sprout’s existing data, analytics and reporting modules. 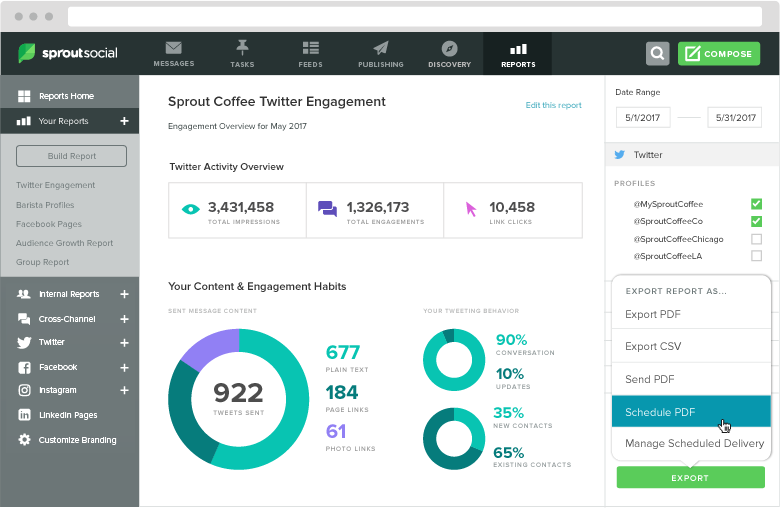 There’s no longer a need to spend valuable time pasting together report sections outside of Sprout—simply create and export a custom report built to showcase the social metrics and insights most important to you and your clients. To create a custom report, use the Build Report button and start by selecting the desired timeframe and profiles. 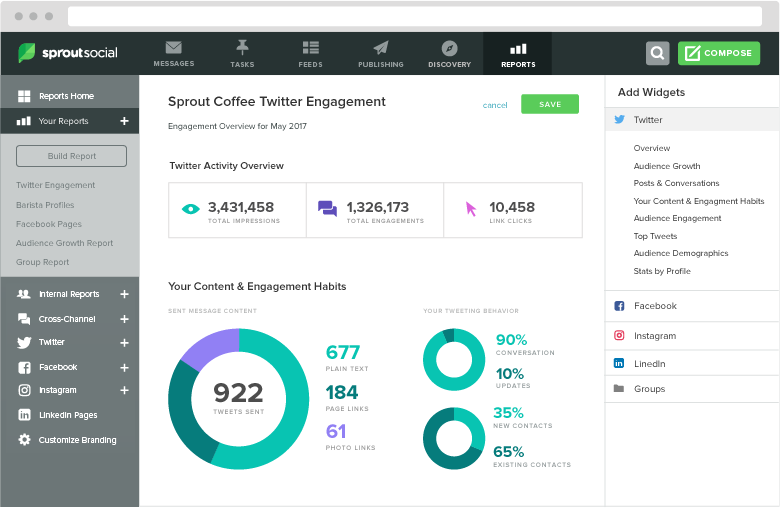 Then choose widgets from the report modules (Twitter Profiles, Facebook Pages, Instagram Profiles, LinkedIn Company Pages and Group Reports) based on the story you want to tell—whether that be social growth, audience engagement, content marketing performance or more. Once you’ve added your widgets you can rearrange, remove or customize each module to focus on the data and insights that are most important to you and your clients. Add in notes to describe what’s included in the report, an explanation of metrics or how the data tells your client’s social success story. If you’re looking to make changes to an existing network or group report, click Edit This Report to rearrange, customize or remove sections. Once you’ve created and saved a customized report, quickly access them again by going to Your Reports in the Report nav. Sprout Agency Partner and All Star Rebecca Wade, owner of digital agency Purple Dog, uses Report Builder to create customized reports for her clients. The customizable Report Builder is a welcome addition to Sprout’s report offerings,” Wade said. “It’s great to be able to narrow down the data to show my clients’ specific goals. Additionally, having the option for cross platform reporting is really helpful. After you’ve built your social media reports, provide presentation-ready PDFs to your clients. Using Sprout’s Send PDF and Schedule Delivery functions, you can quickly and easily share reports through Sprout. Upon delivery, your clients will receive a white-labeled email and PDF that includes their logo. How will your agency use the new Report Builder? Sound off in the comments below.